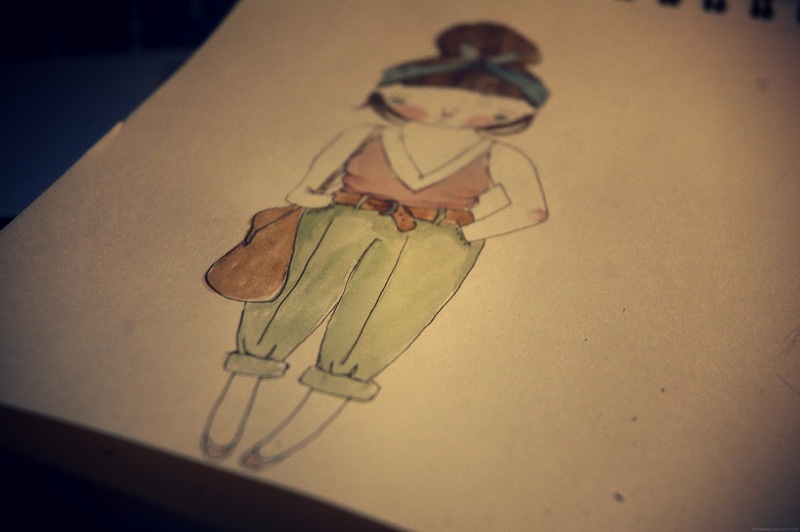 Win a personal outfit illustration…. Normally I would do a link love post on a wednesday but today I thought I am always sharing with you my illustrations it would be nice to offer my lovely readers the chance to win a personal illustration. To Enter leave a comment below with your email or twitter @ name so I can contact the winner once the prize has been drawn. Conditions are you must be a follower of this blog (ella) you can’t enter through twitter just because it can become complicated tallying all the entries. The winner will be contacted after the name has been picked, i will illustrate an outfit from a favorite photo that you can send and illustration will be completed within a few days. I will send you an edited version and the illustration itself. This isn’t like any other give away I have done, so I hope you can all enter…good luck. p.s. you wont win the illustration above, this is just to show you what yours might be like, i will be drawing you from a photo you have sent of your choice! This post came up on my blogger dashboard and all I saw was the lovely illustration picture and I thought I would just be commenting to say how much I love your drawings and how you have styled the faces, but now I have another reason to comment as this is such a lovely giveaway! Oh gosh that drawing so precious, I'd love to win this! such a lovely giveaway and a great way to share your talent! Your illustrations are amazing so cute! I would love to be entered as my blog looks like a bit of a mess at the minute with not even a header! this is a brilliant giveaway, I would love to own such a unique illustration. i have got a new dress which would become a beautiful illustration, how exciting! oh this would be totally cute! i need a new blog banner and it would be perfect! Such a different giveaway! This isn't like any others! Your illustrations are always so delicately drawn! It would be so lovely to have a portrait drawn by your skilled hands 🙂 I'm following you through bloglovin' as I'm on wordpress, Hope that's okay. Oh wow, I love all of your illustrations. This is such a brilliant giveaway Ella 🙂 Please enter me! Lovely, different giveaway!! I'd love to have a little illustration on my blog!! Lovely! … My twitter handle is @reread … My email is on my blog! I would love to win one of your illustrations, I always love them and wish to draw like you! I follow you on GFC as lisamello and on twitter under the same username. Wow, I'd love to win this! This is such a lovely giveaway!!!! Such a lovely giveaway, I've been a fan of your illustrations for some time now! Great Idea! I would love this! What a nice, personal giveaway! Hello! I would love to enter please. I love your illustrations and think this is a lovely idea, i'd love to enter! Your banner is actually amazing! Oooh pick me! Your drawings are so cute! Ooh, I'd love to win! My email is laceandliquorvintage@hotmail.com, XO. This is such a nice idea and I love your illustrations! Oh my gosh this is a brilliant giveaway! Really unique! What an AMAZING giveaway Ella!! I have my fingers, and toes and legs and arms and did I say fingers(!?) crossed!! i love this giveaway, so lovely! I love this blog! I'm a Fashion Journalism student at LCF totally obsessed with fashion illustration and I would love to work with you in the future if you're interested. In the mean time i'll be entering these competitions!! Amazing! aw this is a lovely idea ella, i love you illustrations they're amazing. I love your illustrations! I think this is probably the best giveaway I've seen in a long time! Thanks! This is such a lovely idea and I just wanted to say that I love the design of your blog. It's beautiful! Aw I've always loved your work, would be nice to win one! Oh I would seriously LOVE this! You're such an amazing artist! And it would be so cool to be drawn! This would be so cool, love your style of drawing! ooh, what a brilliant giveaway, love your style and illustrations!! It would be so amazing if I were to win this give-away. I never really enter them, but couldn't pass up the chance to win one of your beautiful illustrations. WOW! Such a different giveaway! I love your illustrations as you are such an amazing artist!